Hy-Vee is an employee-owned chain of supermarkets founded in 1930 by Charles Hyde and David Vredenburg. Their supermarkets are located throughout the United States, particularly in Illinois, Iowa, Minnesota, Kansas, Nebraska, Missouri, Wisconsin and South Dakota. The company ranks among the top 25 supermarket chains and top 50 private companies in the U.S. Its headquarters is located in West Des Moines, Iowa and their distribution centers are in Cherokee and Chariton both in Iowa. Hy-Vee is an employee-owned company where they encourage their employees to guide the company in giving a quality and excellent customer service to everyone. The company’s motto, “A Helpful Smile in Every Aisle” makes it as the company’s operating philosophy and their mission is to help people’s lives be easier, healthier and happier. Hy-Vee’s largest store is located in Urbandale, Iowa comprises of a full-service supermarket with bakeries, floral department, pharmacies and food services. The company is committed to providing their customers healthy lifestyles which have growing HealthMarket departments full of natural and organic products. Hy-Vee has a well-established distribution system with a goal of providing the highest quality merchandise and to transport it quickly and smoothly to all their retail operations. As part of the company’s community service, they support organizations that care about the general well being of children with regards to their physical, emotional and educational needs. The company also provides a scholarship program to their associates both high school and college students through their Hy-Vee Foundation. Hy-Vee’s current Chairman, CEO and President is Mr. Randy Edeker. Hy-Vee was founded in 1930 by Charles Hyde and David Vredenburg. They opened a general store in Iowa and more stores were started. In 1938, the company incorporated into Hyde & Vredenburg, Inc. and had 15 stores in Iowa and Missouri. In early 1940’s, the company opened a new type of store at Centerville, Iowa that offers a self-service and frozen food case to customers. During this time also they opened their first supermarket outside of town located in a brand new building and with own parking lot. In 1948, the company’s distribution center opened in Chariton, Iowa . The founders retired in 1949, where David Vredenburg died later that year. They held a contest to rename the stores in 1952 where the winning name Hy-Vee was created by the co-founders names. In 1957, they opened the first in-store bakery to provide a one-stop shopping experience for their customers. In 1960, the company established an Employees’ Trust Fund where all eligible employees are able to share in the ownership of the company, that’s why it’s known as an employee-owned business. In 1970’s, the company opened more stores, particularly in South Dakota, Nebraska and Illinois. During 1980’s, they expand their services to customers where they include video rentals, bank branches in stores and pizza parlor. 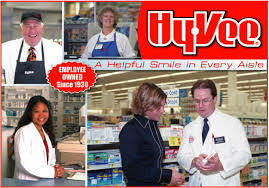 Hy-Vee had various operations in 1990’s, where they purchased various subsidiaries, including Sunrise Dairy in 1991, Florist Distributing Inc. in 1992, and Meyocks Group in 1994. In 2000, Hy-Vee focus on customer’s healthy lifestyles. They introduced HealthMarket, a private label product in 2001. Mr. Randy Edeker was elected as the company’s president in 2009. By 2010, Hy-Vee continues in focusing on health and wellness of their customers by adding more in-store dieticians. Their distribution center in Chariton, Iowa expanded to provide more space for frozen foods and other produce. In 2012, Ric Jurgens retired as the CEO and Chairman of the Board and Randy Edeker, the company’s president was also elected as the CEO and Chairman of the company. You will be responsible for selecting products in the warehouse from an order request. You will do frequent lifting and walking up to 6-8 hours and you will assign to clean the warehouse as directed by supervisors. You will be responsible for operating company vehicles and equipment and ensure on time delivery of products to customers. You will also unload and load trailers and complete paperwork with regards to driving duties. You will prepare store orders and select items via voice automated selection system and package the order for shipment. According to the reviews made by the current and previous employees of the company they said that Hy-Vee is one of the best companies in the world that offers multiple opportunities for growth and advancement. The company treats their employees as a family and recognized their years of service. The management expected their associates to go above and beyond for customers and make a difference in their lives. 84% of the reviews were approved by Mr. Randy Edeker, the President, CEO and Chairman of the company.